Food is the most important factor for a healthy liver. What we eat, when do we eat, why do we eat, and how much do we eat? These are crucial. Our food should not put a load in the liver. We must eat those food which aid in the function of good quality of blood and glucose. We must realise that the main aim of food intake is to give us energy and health. Junk food, fried food spicy food, maida, products, poisonous drugs, fatty foods, alcohol, etc are very harmful for the liver and their consumptions should be avoided. Fruits, vegetables and fibrous food aid the liver in the functioning properly. Our food must be balanced, alkaline and not acidic. Liver is a part of the digestive system of the human body and is situated below the heart and the lungs, beneath the diaphragm. The diaphragm separates the heart and lungs form the stomach and its various organs such as liver, duodenum, pancreas, gall bladder, small and large intestines, etc. on the right side of the stomach is situated the liver. It is not only most important organ of the digestive system, but it performs almost 500 jobs and if it fails to perform any of its important functions, the human body will collapse. 1. Liver is like a huge biochemical factory, which produces more than one thousand enzymes to handle various chemical processes in the body. The food which we eat is first made into a thick gravy by the stomach and the small intestines, and is converted into glucose. Blood glucose is mainly controlled by the action of the insulin secreted by the pancreas and also by the liver. Liver transforms extra glucose into glycogen and stores in it for emergency energy needs of the body. 2. It keeps a balance of glucose in the body. For absorption of the glucose into the blood, it is the liver which activates pancreas to produce insulin; otherwise a disease called Diabetes Mellitus occurs. 3. Liver makes antibodies to fight disease. 4. Our food consists of five main ingredients- carbohydrates, proteins, fats, vitamins, and minerals. Most of these elements are broken down by our metabolism, it is the liver which helps in handling the urea and the waste products by the food, in controlling, and excretion of these waste products. These waste products are highly toxic and if left untreated by the liver, can poison the blood very quickly. Liver is thus a great detoxifier. 5. We often consume junk food, and various drugs and medicines which contain toxins and poisons. Our food, fruits and vegetables are loaded with germicides, pesticides. It is the liver which detoxifies these toxins in the body. If even a very tiny portion of these toxic agents get mixed with blood, we will meet a fatal end very quickly. All the toxic elements in our food, water, alcohol, cold drinks etc. are broken down into harmless carbon dioxide and water by the liver, and later eliminated from the body by lungs and kidneys. 6. As we all know, our blood contains cholesterol (both HDL and LDL), triglycerides, free fatty acids, etc. These elements are manufactured by the liver from our food. HDL is good cholesterol while LDL is bad cholesterol; a balance between these must be maintained in the blood to keep our arteries healthy. When LDL increases in the blood, it creates blockages in the coronary arteries and can cause heart attack. Thus, the functioning of the heart is very much dependent on proper functioning of the liver. 7. Liver produces vitamins, particularly B12, which is essential for production of blood. If liver stops production of vitamin B12, it will lead to pernicious anaemia. Vitamin B12 is crucial for formation of Red Blood Cells or Haemoglobin. 8. Liver produces Bile which is the essential enzyme for digestion. If this function is upset, it will lead to Jaundice or Hepatitis A. As we all know, jaundice is a very serious disease in which billions of liver cells gets destroyed very quickly. If jaundice occurs, the antibiotics do not work. Jaundice is primarily caused by wrong and contaminated food/water and a very Strict Diet Control and Rest alone is very helpful in curing jaundice. Jaundice is often caused by strong antibiotics, allopathic medicines. Therefore, the use of powerful medicines can cause a lot of damage to the liver. 9. Use of strong allopathic medicines and other poisonous substances can lead to Liver Cirrhosis (hardening of the liver), which is very serious disease. There are other serious liver diseases like gall stone, congestion of the liver, atrophy, enlargement, liver pain and cancer of the liver. Alcohol is an enemy of the liver and causes cirrhosis of liver. That is why people who consume too much liquor, are prone to liver diseases, vomiting etc. leading to fatal results. 10. Excessive consumption of fats, particularly animal fats can also lead to fatty liver and serious liver disease. 11. Liver produces a lot of hormones which are essential for the digestive systems, and metabolism of the body. It also produces chemicals essential for clotting of the blood, without these chemicals our blood will become thin and in times any injury will cause the blood to drain out of the blood vessels very quickly, leading to instant death. As we are aware, excessive thickening and clotting of the blood can also occur due to excessive cholesterol in the blood, excessive thickening of blood leads to heart disease. Doctors usually prescribe blood thinning drugs for heart patients to reduce viscosity of the blood but sometimes, these drugs cause excessive thinning of the blood, leading to fatal results. Liver has got a wonderful quality – it continues to work efficiently even if 80 to 85% of its cells and tissues are damaged, without even causing any symptoms. But this, by itself, becomes livers’ weak point also, as liver damage can sometimes go too far without causing any symptoms, creating complications. Liver possesses another very stray quality – it regenerates itself quickly; it rebuilds its cells and tissues, which no other organ of the body does. This is a unique feature which keeps our liver strong and healthy, in spite of our constant violations in our food habits. How to keep our liver healthy? We now know that liver is the most important organ of the body; without its proper functioning, all other organs by the body such as heart, lungs, kidneys etc. cannot function properly. It is the liver which supplies blood to the heart. It is, therefore, of vital importance that we keep our liver healthy. We have already given indications above as to how liver gets damaged. 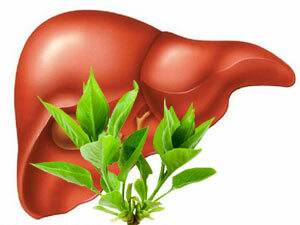 Nevertheless, it is essential to pinpoint the steps necessary for a healthy liver, as under. 1. Food is the most important factor for a healthy liver. What we eat, when do we eat, why do we eat, and how much do we eat? These are crucial. Our food should not put a load in the liver. We must eat those food which aid in the function of good quality of blood and glucose. We must realise that the main aim of food intake is to give us energy and health. Junk food, fried food, spicy food, maida products, poisonous drugs, fatty foods, alcohol, etc. are very harmful for the liver and their consumptions should be avoided. Fruits, vegetables, and fibrous food aid the liver in the functioning properly. Our food must be balanced, alkaline and not acidic. 2. Clean and pure drinking water is good aid for liver. 3. Poisonous substances such as pesticides, germicides, chemicals sprayed on fruits, vegetables and other food items should be avoided or their effects be minimised by thoroughly washing fruits, vegetables, pulses etc. before eating them. 4. Drugs must be avoided at all costs to save the liver. We should resort to Naturopathy in case of illness and not to drugs. 5. Nature Cure Treatments: such as mud packs, cold towel pack, hot and cold pack on abdomen, fomentation and wet packs to abdomen, cold hip bath, hot and cold alternate hip baths. Steam bath, cold immersion with friction. Neutral immersion with friction all are helpful to detoxify the system, and improves liver function. 6. Fasting Therapy : weekly one day fasting or 2/3 days fasting with diluted fruit juice, coconut water, lemon water,honey when our digestion or health upsets is a good practice to give physiological rest to liver and whole body. 7. Physical activities like brisk walking, jogging, exercises, Yogasanas and pranayama must be done regularly. Yoga, particularly, is extremely helpful in the production of essential hormones by the liver (and for other parts of the body). We have already mentioned that 80 to 85 percent of liver can get damaged, without creating any symptoms. Therefore, daily exercises and yoga became all the more important to keep our liver always healthy. There are a large number of easy Yogasanas such as Trikonasan, surya namaskar, kamarchakrasan, paschimottanasana, ardha matsyaender asan, jangasan, pavanmuktasan, makarasan, shalabhasan, mandookasan, vajrasan, which keep our liver active. Agnisar, kapabhati are also very useful. About 30 to 60 minutes of yoga daily can keep not only liver but all other parts of body healthy. PLUM (or Aaloo Bukhara) is the best food for liver. In case of jaundice, enlarged liver, etc. use of plums is highly recommended. The use of lemon, amla, oranges and papaya is good for liver as these helps to activate and protect liver and maintain its normal function. All Red, Yellow & Orange fruits and vegetables and dark, green leafy vegetables (which are bitter in flavour). All are rich in beta-carotene and antioxidants, which are very helpful and necessary for optimum liver and gallbladder health. Peppers, Carrots, Beetroot, Artichoke, Squashes, Pumpkin, Asparagus, Tomatoes, Lemons & Limes, Oranges, Apricots, Grapefruit, dark leafy greens such as spinach, kale, chard, broccoli, cabbages, dandelion leaves, chicory, fennel, spring greens … Olives (green or black) and extra-virgin Olive oil. All digestive herbs and spices such asGarlic, Ginger, rosemary, marjoram, oregano, cinnamon, fennel seed, cardamom, aniseed, cloves, parsley, turmeric, fenugreek, peppermint, spearmint, dill, caraway, bay, chervil, tarragon, cumin, horseradish, chamomile and sprouted grains and seeds. All chlorophyll-rich greens like cereal grasses (barley, alfalfa & wheat grasses), micro-algae such as spirulina and chlorella. Lower the fat intake. Less refined, cooked oils or fats. Obtain most of the essential oils and fatty acids from whole nuts and seeds, and extra-virgin olive oil. Rest the digestive system whenever possible. Don’t eat too late at night or too early in the morning. Don’t eat when you’re not hungry, and especially never over-eat. Be aware of proper food combining. Sweet fruit and cooked protein are the worst combination, causing fermentation in the gut. Regular liver flushes and increased lemon-water intake is good to keep the liver moistened and free-flowing. The elimination channels should be open and free. Exercise to eliminate from the lungs and skin. At least two bowel movements a day is normal. Massage the liver area at least once a day to help remove congestion. Antioxidants such as vitamins E and C, beta-carotene, zinc and selenium are protective against a build-up of toxins. Herbal antioxidants are superior to synthetic vitamins, however both can be used together. Herbal formulae to cleanse, protect and stimulate liver and gallbladder function are highly recommended. Roasted dandelion root, Chicory and Ginger tea, or other digestive herbs such as ‘Yogi-Tea’, cinnamon, fennel seed and cardamom can be taken daily on a long-term basis. Milk Thistle seed is a must for protecting and rebuilding proper liver and gallbladder function, especially when they have been compromised, or weakened in any way.